O! Pumped 1, 2 & 3 MP4 – Oxycise! Three quick but challenging workouts to build strength and endurance. These 6-minute workouts add some movement and power to the Oxycise! breath, while remaining low impact. Not only will you keep burning that fat, you’ll also focus on building strength and endurance. You will be standing in the first workout, and on the floor for workouts 2 and 3. Download with or without background music. Get ready for some bun burning and core strengthening! 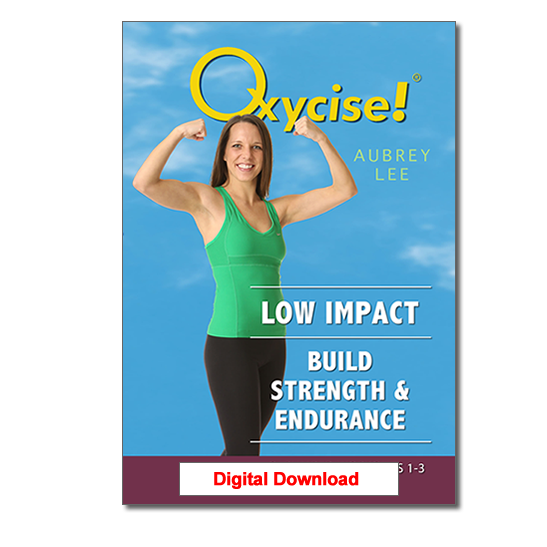 This workout should only be used after learning the Oxycise! Breath taught in the Introduction to the Basic Breath and Techniques. I really like these quick workouts, no excuse to not do at least 1 since it’s only 6 mins long each. My face is #1, but all 3 do leave me feeling that I’ve exercised something. I love this work out. It is a challenge without feeling too sore the next day. I like the positions and I like that it’s a little different to the traditional isometric exercises. I would however prefer the new dvds to have a separate exercise explanation and demo like Jill has done with all of hers. I have all the workouts and I enjoy them all! Love the workout; they are short and impactful! I love these quick workouts. I sometimes tack them onto the end of the other Oxycise workouts to help me “close my 30-minute exercise ring” or just alone on days when I’m in a rush but want the benefits for my metabolism. The new positions that include a bit of motion are a fun challenge since I’ve been doing Oxycise for over 20 years. It’s the only thing that consistently works for me. I just did the new Pumped O workout! I love the name! It really fits the workout! Wow!! I loved it! It’s adds a new dimension to the workouts. I had some sore muscles the next day! The movement makes it more challenging and I loved the challenge. I’m excited to include this to my collection of O workouts. So excited to do it again! !